We all know that the British top runway model, Naomi Campbell will always be the Queen of the runway! The 5ft 9′ model is in Nigeria precisely in Lagos to host the Arise Fashion Week. The event currently holding at the Intercontinental Hotel in Victoria Island has been the talk of town since her arrival. 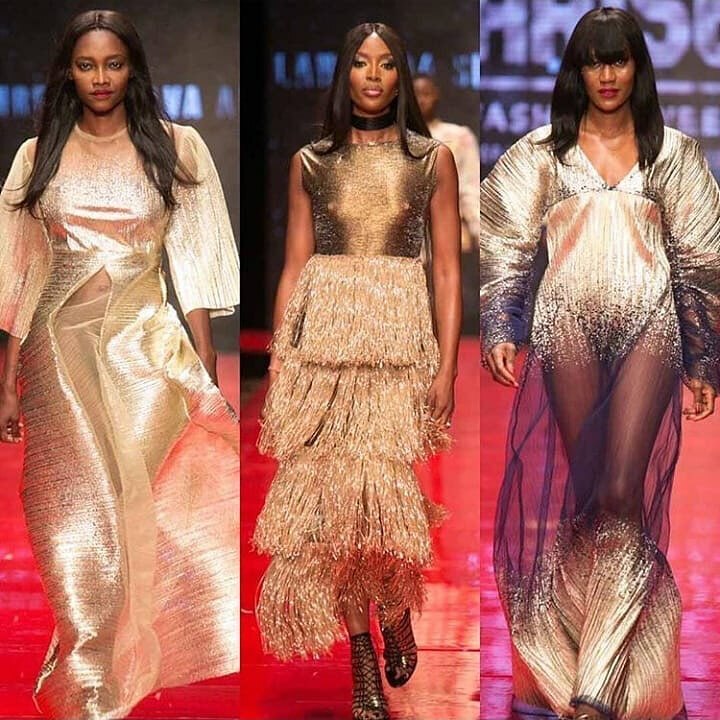 The event kicked off a day ago bringing together the bigwigs of the fashion industry, the top designers and reuniting Nigeria’s own top International models-Oluchi Onweagba and Ojy Okpe. It was a moment to cherish as the international model graced our runway in her iconic walk and then teamed up with Oluchi and Ojy for the Lanre Da Silva Ajayi collection. Such a humbling moment for us and yes, Naomi Campbell did that! Meet the three superstar models! Don’t you just love the way they looked? Stunning! Aso-Ebi Styles #132: Slay In A Pink Themed Outfit! Cover Girl Alert! Prolific Writer, Chimamanda Adichie Is Today’s Woman April Cover!